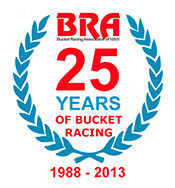 Round 1 of 2014 PCRA-BRA Bucket Club Championship. 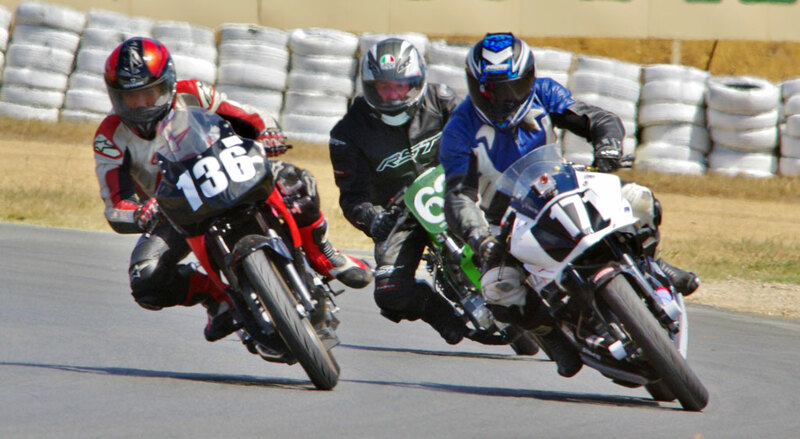 The 2014 PCRA-BRA Club Championship series got off to a great start at Wakefield Park. 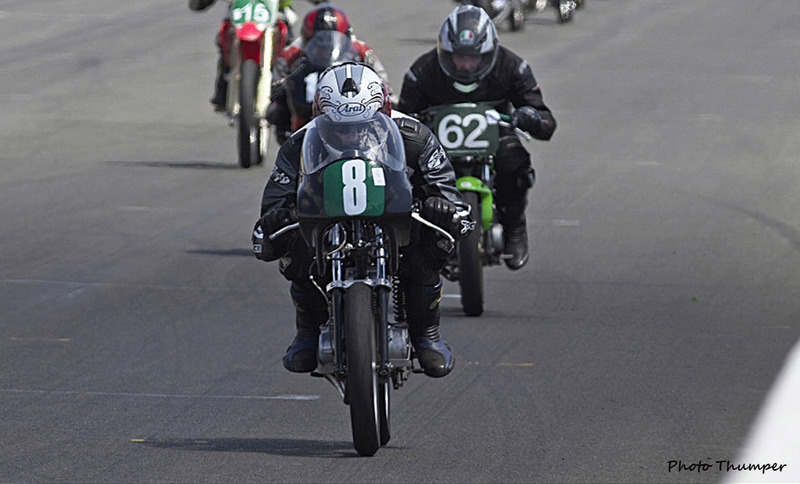 A strong entry of buckets in all classes was present with a number of newcomers trying their hand at tarmac racing. The racing was close and exciting with the usual suspects up front but some of the newcomers look like they may be quick enough to cause some upsets through the year. Temperature on the day was a tad under 40 degs. which made life in leather suits a little uncomfortable. A few races were red flagged due to incidents on the track and further delays were caused with oil on the track that had to be cleaned up. The end result was race 3 had to be cancelled. After qualifying the front row had #77 Tyler Bradford (BBE Honda CBR150) on pole, #6 Jason Dunn (Honda RS85CR) on pos. two, #94 John Olip (Moriwaki85) on three and #14 Ken Lawrence (Honda RS150CRF) on four completing the front row. First of the Superlites was #38 Walter Murphy (BBE Honda CB150) with #169 Ian Gregory (Honda CB150) and #2 Ken Lindsay (KLR Honda RCB150) next. 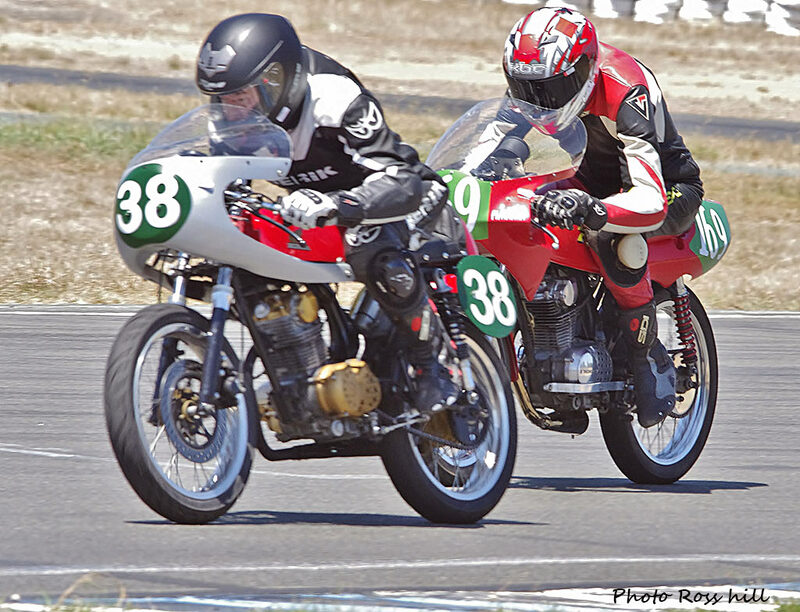 Quickest Commuterlites rider was #171 Arthur Cook (Yamaha YFZR125) followed by #136 Ron Pulido and best Commuterlite AM was #17 Adam Cameron. Jason Dunn (Honda RS85CR) quickly took command in both races from #77 Tyler Bradford (BBE CBR150) and rising star #28 Jack McGauley (Honda RS85CR) showing his mettle. Jacks dad Marty took 4th place riding a motocross CRF150R. 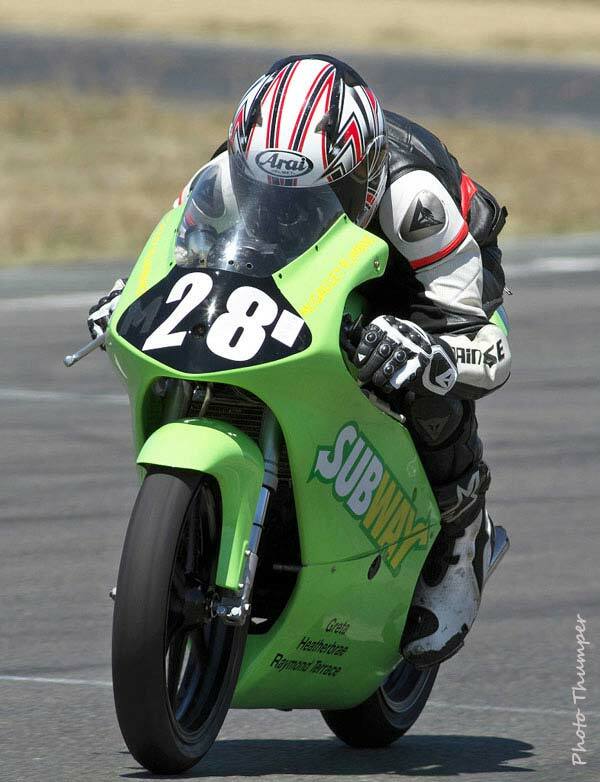 Stephen Kairl on his 150cc (SuperMono 150) not the 197 finished 5th. 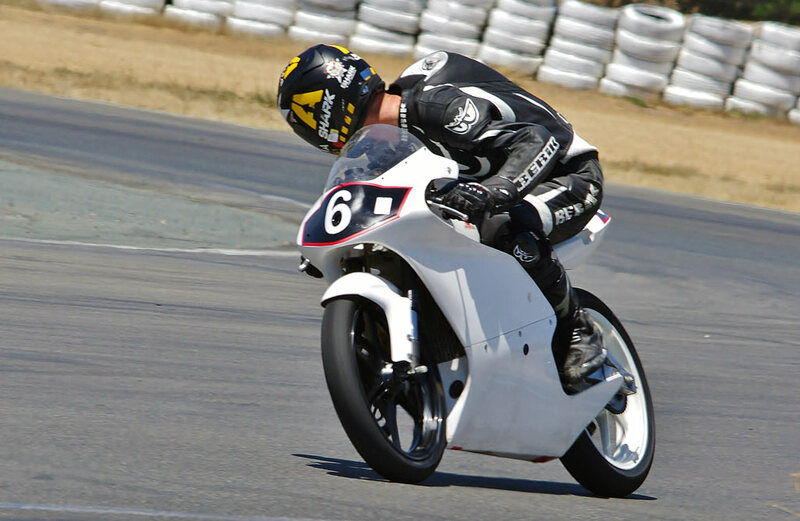 Next finisher was Ken Lawrence riding the wheels off of his P4 (Honda CB125) as his (Honda RS150CBR) had dropped a valve in qualifying. 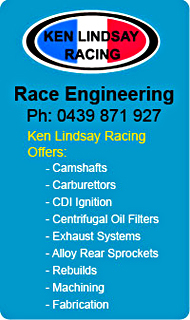 Ken still gained some valuable points on the little 125. Next up was #11 Michael McLean (Honda CBR150) followed by a racy #63 Bob Murphy (Honda 200) with #18 Brian Mowle (Honda CBR150), newcomer #15 Daniel Budniak (Honda CRF150r) and #170 Michael Child (Supermono197). In the Superlite PRO Class the battle between #38 Walter Murphy (BBE Honda CB150) and #169 Ian Gregory (Honda CB150) took up where it left off last year with #2Ken Lindsay keeping a watching brief in 3rd. In race1 Walter pipped Ian on the line by a mere 5 hundredths of a sec. #65 Tim Smith finished a solid 4th. with #4 Marty Kraaymaat the only Honda twin still running in the class came home 5th. #8 Kurt Wagus came out on top with a 2nd and a 1st. 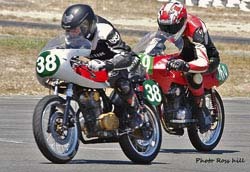 #62 Jim Murphy was close behind with 1st and 2nd places with Kurt getting the win by dint of winning the final race. For 2014 the Commuterlites are to be run in 2 classes PRO and AM similar to the Superlites. 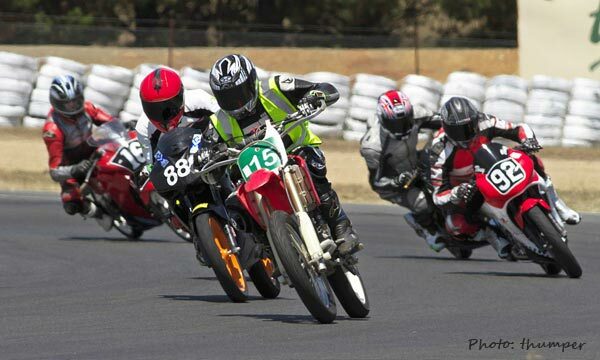 Final grading will take place after the next round at Eastern Creek. 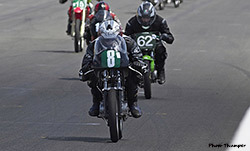 Some great racing was put on by both classes with several newcomers showing a surprising turn of speed in the AM class. #136 Ron Pulido (Honda CBR125) was in fine form and came out on top after a great battle with #171 Arthur Cook (Yamaha YFZR125 the lone Yamaha in the PRO class) and #888 Jack Robinson (Honda CBR125). 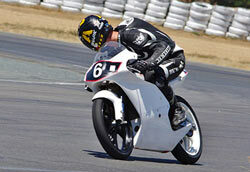 #16 Robert Young (Honda CBR125) finished 4th. #73 Oliver Higgins came out on top with newcomers #17 Adam Cameron 2nd and #9 Graham Campbell 3rd. 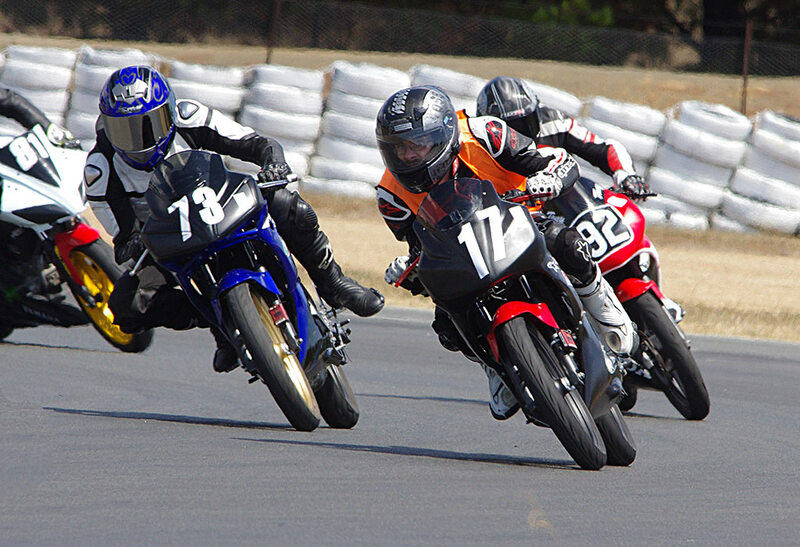 In fact #17 Adam won race 1 and was 3rd in the shortened 2nd. race wearing the newcomers Hi-#73 Oliver Higgins came out on top with newcomers #17 Adam Cameron 2nd and #9 Graham Campbell 3rd. 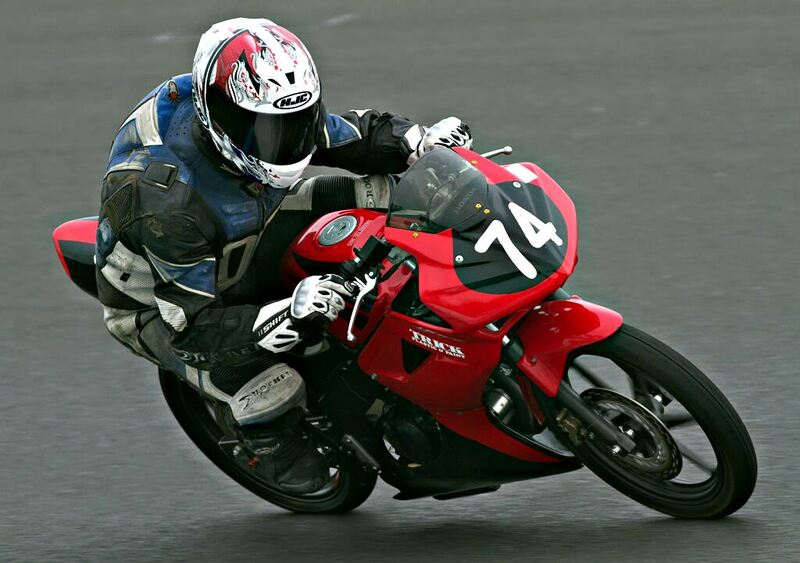 In fact #17 Adam won race 1 and was 3rd in the shortened 2nd. race wearing the newcomers Hi-vis vest. #48 Ron Wenban showed a good turn of speed to put it up to some of the younger guys. #92 Tony Martin on his nicely turned out CBR125 finished 5th with the BRAs hard working Commuterlite rep. #35 Peter Brown 6th. A fast improving #131 Rez Pulido came home in 7th. place followed by #10 Jason Blanch, #81 Robert Tisdell, and #3 Peter Lindsay. #13 Andrew Martin and #26 Anthony Vassallo both had a DNF but they still scored some valuable points. #3 Peter Lindsay having his first run on tarmac had a grin from ear to ear after finishing both races. 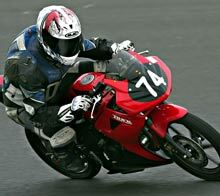 Note: All were riding Honda CBR125s except #81 Robert Tisdell who was riding a Yamaha YZFR125. Many thanks to all the Flaggies and officials who never faltered in the 40deg. heat. There is a reasonable break to the next event, hopefully the weather will be a little kinder to all by then. Newbie #15 Daniel Budniak (Honda CRF150R) with #888 Jack Robinson (CBR125) #92 Tony Martin (CBR125), #9 Graham Campbell (CBR125) and 16 Robert Young(CBR125) hot on his heels. 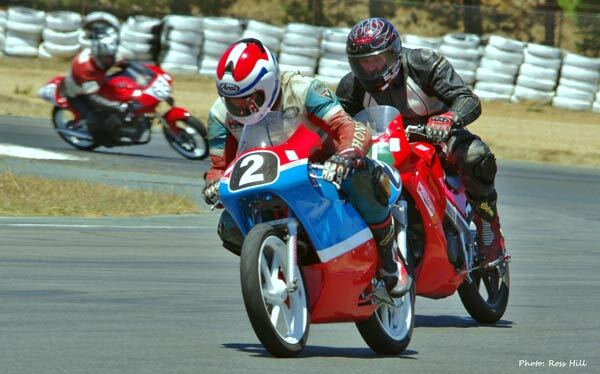 #2 Ken Lindsay (KLR Honda RCB150) dicing with #11 Michael McLean (Honda CBR150). Ken finished 3rd in the Superlite Pro Class. Battling Motolites. 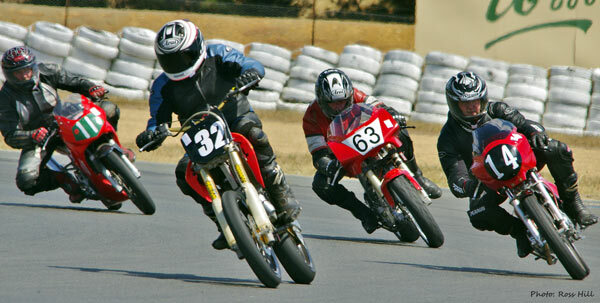 #32 Marty McGauley leading #14 Ken Lawrence, #63 Bob Murphy and #11 Michael McLean. Improving with every outing #28 Jack McGauley (Honda RS85CR) showed his mettle by finishing 3rd overall giving him a great start to the Motolite Championship.